Burgundy lovers enjoy boasting of a small subregion they know that isn't famous where the wines are much greater than their official reputation. Rully, home of delightfully tropical-tasting white wines, is one of these for good reason. Rully is the northernmost village in the Côte Châlonnaise, which is geographically the middle class of Burgundy. The upper class is the cooler areas to the north; the hoi polloi is the Mâconnais to the south. If you look at it this way, Rully is the upper-middle-class. Most of Côte Châlonnaise is known for good-value red wines. Rully is different in that, although about a third of the wine produced there is red, the stars are the whites. "It's just 5-6 kilometers from Chassagne-Montrachet. 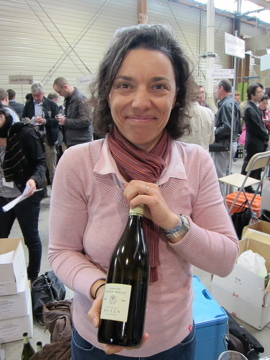 We really have similar soils," says Hélène Jaeger Defaix. "If you have a good location, you have the style of Côte de Beaune with the pricing of Côte Châlonnaise." One factor keeping prices down is that while there are 23 1er (Premier) Cru vineyards in Rully, there are no official Grand Cru vineyards. Rully accomplishes a feat with Chardonnay that seems impossible in most of the world. Many of the 2010 Rullys I tasted today were intense yet balanced, offering ripe tropical fruit without excessive weight on the palate. The best ones don't rely on toasty oak or strong leesiness for their flavors, as it would cover up those vibrant pineapple, papaya and passion fruit flavors. I would avoid the '09s, though, as they are what Jaeger Defaix calls "more solar." This is an ongoing theme I'm discovering at Les Grand Jours: while warm temperatures in 2009 in Burgundy may have benefitted many red wines, they were a bit much for many whites. Rully wines are drinkable on release, but may not age as long as some of the whites from further north; you probably want to drink them within 5-10 years of harvest. They also can be a little higher in alcohol, many reaching 14%. 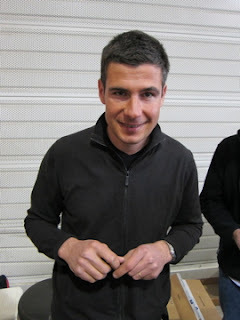 "If you buy from Côte de Beaune and you have to wait, you can have the Rully during that time," Jaeger Defaix says. Two of the wineries I like best in Rully are certified organic, and their wines taste particularly lively. Vincent Dureuil of Domaine Dureuil Janthial says he stopped using herbicides in 2001 because he was concerned about the health of his workers. "Before, I was the last one to harvest," Dureuil says. "Now I am the first one to harvest. It changed radically the maturation of the grapes." Jaeger Defaix took over her eponymous winery from her aunt in 2005, and immediately started working organically. "I think the wines are more precise, more elegant," she says. "But is it a question of only organic? Is it also just improving our winemaking? Certainly the wines have improved. Our importers and customers also say it." I'm not sure if this reporting anecdote is too inside-baseball, but here goes: I started my Rully tasting at Maison Joseph Drouhin's table. There was a young guy pouring and an old fat guy with a walrus mustache standing nearby. I asked, "How many bottles do you make every year?" The walrus walked over and said, "What kind of question is that?" Actually, it's a question I should probably ask every winery, because production size matters: people (not just me) want to know if there are 100 cases or 10,000 cases of a wine. I said, "Are you the winemaker?" The walrus said, "I am not the winemaker, but I have worked for this company for 33 years." While he was talking, the young guy said quietly, "We make 10,000 bottles." I said to him, "What percentage are white, what percentage are red?" The walrus interrupted, "You ask weird questions." I said, "OK, I'll go talk to some winery that wants to be written about." The walrus said, "Good. Go and do that." I said, "You know, you probably should not be representing your winery to the public." But maybe he was doing exactly what he was hired to do, because the Drouhin Rully blanc from 2010 was thin and rather characterless in a good year for the region. Perhaps Drouhin is simply producing too much wine and can't maintain standards. Balking at revealing production numbers is a reasonable way of hiding that. If France stopped making wine tomorrow, gourmets would still flock here for the cheese. I stopped into a cut-rate grocery shop near my hotel to buy mineral water -- why can't any US companies put 2-liter bottles in stores for under 25 cents, as they do all over Europe? Even though all of the cereals and cookies and the like were knockoff brands, it still carried raw-milk Epoisses and Mont d'Or and Reblochon. My cheese discovery last night was l'Ami du Chambertin. I love that name: the friend of Chambertin. It's a raw cow's milk cheese that turns semi-solid at room temperature. The rind is washed with Marc de Bourgogne, giving it a strong, earthy flavor that's not overly sharp with a rich, buttery mouthfeel. This might be one of the cheeses I bring home from this trip. About bringing home raw-milk cheese to the US: While technically illegal, I've never known anyone to get it taken away. US customs is very interested in meat and they will take away your uncured ham, which the beagles go nuts over. I once packed a raw-milk Epoisses, a Burgundy cheese known for its pungent aroma, in the outside of my checked bag. KLM bollixed the baggage connection and my bag spent 24 hours in Amsterdam at room temperature. When the bag reached San Francisco, you could smell it from two rooms away. I know this because the bag made it through customs and KLM delivered it to my house. The driver probably doused his car in cologne afterwards, but that cheese was tasty. Maybe instead of running to it, the beagles ran away yelping. Thanks for the Rully tasting notes, Blake. Out of curiosity, have Rully wines had the same problems with premox as their more notable neighbors to the north? 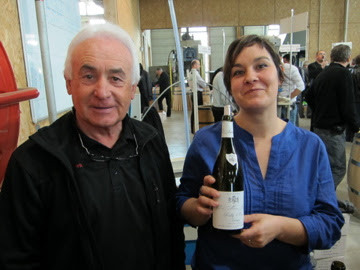 As a more general question, do you know if makers of white burgundies have tried any new techniques recently specifically to combat premox? Guren: That's a good question and I don't have a good answer. A large group of us were served many bottles of a 1982 Batard-Montrachet at a dinner this week -- this is part of the thrill of dining in Burgundy -- and many bottles were oxidized, but I don't think 30 years counts as premox. I know some people believe that corks are an issue and there has been a big emphasis in the last decade on taking more care about cork quality. But we can't ignore the natural wine movement encouraging people to use less sulfites. I'm sad to say I didn't taste enough older Rullys to have personal experience.